SoftPlanet makes it possible for everyone to get free VIPRE Antivirus download directly from our servers. There is no registration needed for downloading. VIPRE Antivirus 2014 7.0.6.2 is a powerful security shield, which is capable of securing your PC against all kinds of Internet-based threats. It comes with lots of great features and an intuitive interface. This app guarantees that you will stay protected with minimum interventions on your side. The basic functionality of the app is the scanning process. It comes with three different scan modes – quick scan, which checks only common locations, deep scan that analyzes all stored files and custom scan that checks particular files and folders. As most antivirus soluitions, VIPRE Antivirus 2014 7.0.6.2 has a core engine that is its “heart” actually. It works with three different layers of detection – signature, heuristic and behavioral. The first one detects well-known malware. The second detection layer seems to be characteristic detection. What it actually does is to look for known bad patterns inside a file. The last layer looks at program behavior. 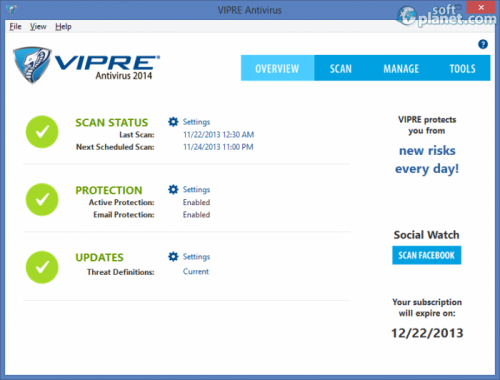 In addition, VIPRE Antivirus 2014 7.0.6.2 provides you with active and email protection. 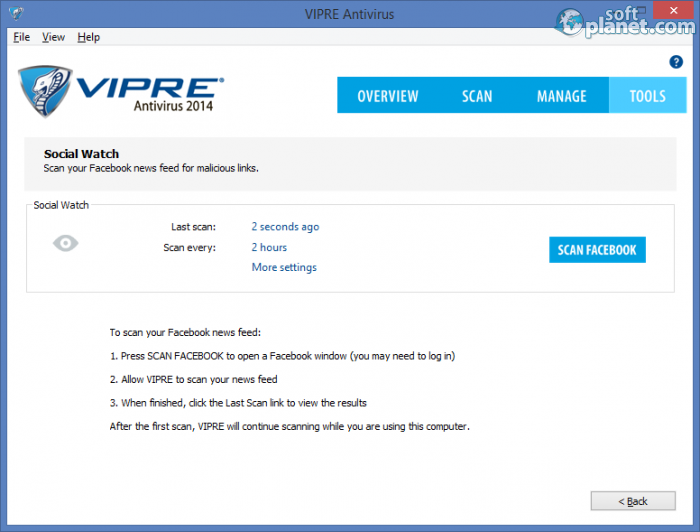 VIPRE Antivirus 2014 7.0.6.2 is one of those less-known security solutions, which doesn't stop surprising me pleasantly. It comes with a very clean interface. It is very well-structured. The interface arrangement reminds of a website. Basically you have a navigation bar on top. Switching between the four tabs is very smooth. The color scheme is just perfect unlike some intrusive ones. Each feature is placed within the most appropriate tab. 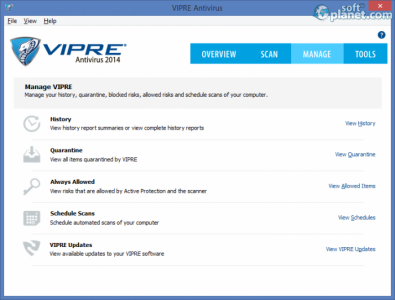 This fact makes VIPRE Antivirus 2014 7.0.6.2 a very intuitive software product. However if you are an old school guy, you can use the simple toolbar on top of the main window in order to navigate across the different functions. Most of them are a click or two away from you. The application works very smoothly. It uses a minimum number of system resources actually, which is very surprising for such an useful program that does a proper job. Thus you can run a scan and continue your work. During the whole test I couldn't notice a single bug or delay. The app seems to be a very stable security solution. Please be aware that VIPRE Antivirus 2014 7.0.6.2 is paid software and comes with a 31-day trial period, within which you can try it for free. After then you need to pay $39.99 for a 1-year subscription in order to stay protected. If you are looking for a fresh security solution, which could be a proper substitution of the princes of this field like McAfee, Panda, Kaspersky, etc., VIPRE Antivirus 2014 7.0.6.2 might be your software product. It backtracks in no way to the abovementioned brands. Try it and you will convince yourselves in its advantages. Please share your opinion with us. Our security scan shows that VIPRE Antivirus is clean from viruses. 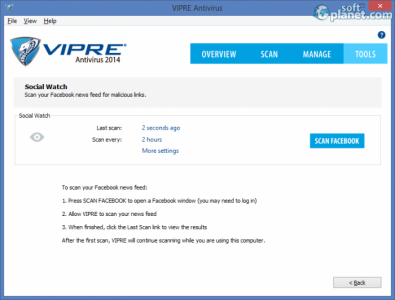 The current version of VIPRE Antivirus has been scanned by our system, which contains 46 different anti-virus algorithms. 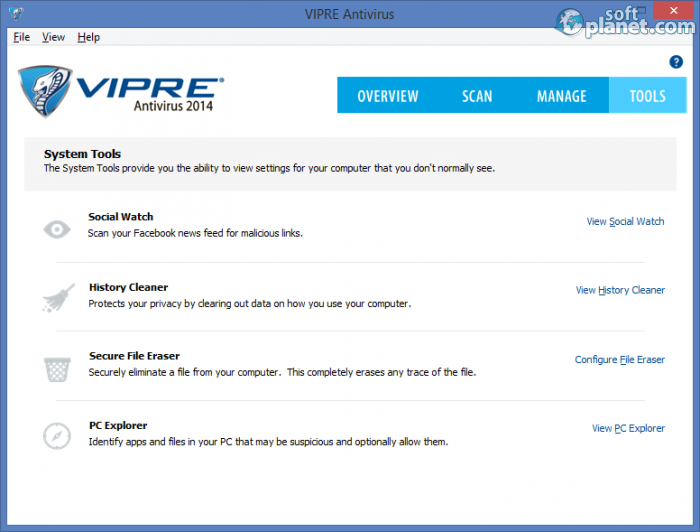 That ensures that VIPRE Antivirus 7.0.6.2 is 100% safe for your computer.